Over the months we have built up a solid core of regular workers, supplemented by others who will only commit for a day. Many men looking for work also have committments to their families who grow fruit and vegetables in the surrounding countryside, and have to be available for harvesting. Each morning we drive up in Dolores, our minibus, to 'the clock', a 'hangout' place in Sucre for men looking for work, and are immediately surrounded by our regular men plus around 20 or more who want to be taken on for a day or more. We can only transport 6 in the minibus, so many are disappointed. There are different categories of workers. 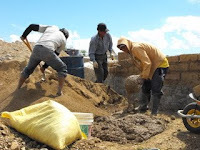 Maestros are those who are very competent in their field and will work with an ayudante, or labourer, who is at their beck and call for anything needed. Ayuadantes who work regularly with a maestro become very competent in their supporting role. There are also peones, who do not work with a maestro, but simply do what they are told to do by the person in charge. Ed of course is the person in charge, the Project Manager. It is very unusual to have a client who is also running the project and it took a while before our workforce recognised that he actually knew what he was talking about and had practical experience in all aspects of building. Every day Ed instructs the maestros in the next stage of the work and also directs the peones in whatever needs doing. Very occasionally he puts his hand to tasks such as experimenting with adobe rendering on our shed and inserting strengthening bolts into what will be the wooden stairs linking the ground floor living room with the mezzanine. 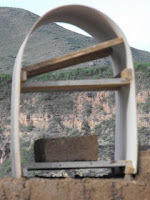 He also designed and built the forms for the adobe arches between the rooms as most Bolivian workers have no experience of using power tools. 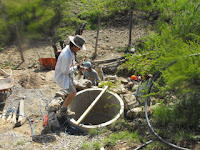 Hipolito is our foreman, in charge of the project in Ed's absence. He is married and lives with his wife in Sucre. 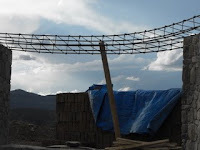 He is only 26 years old, but sees in our project the opportunity to learn techniques of design and build that he would not otherwise come across in Bolivia. He is technically very skilled, particularly in concrete work. 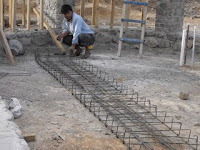 He supervised the building of the cistern and is currently working on creating the curved concrete lintels that will span the large glass doors and windows. Our stonemason and adobe expert, Jeronimo, is seen here in the centre of the picture below with his ayudante, Freddy, on the left. 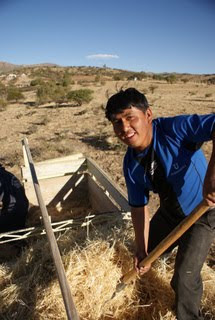 Both of them live locally, Jeronimo has a farm but works with us to supplement his income and to save money to put his three sons through university. 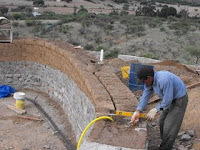 Jeronimo is a quiet, modest man who produces a quality and consistency of work that astounds us. He loves the design of our Roundhouse, and is very proud of his involvement in the project. On the right of the picture is Mario, who started off as a casual worker, but was always eagerly at the front of the line at 'the clock' in the morning. 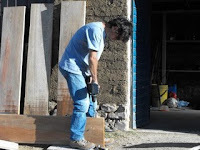 He is now working permanently for us as Hipolito's ayudante and is very hard working. 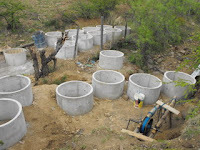 His family live in the countryside but he lives on his own in Sucre in order to get work. Our workers day starts at 8am. They have a 30 minute break mid-morning, when coca leaves are distributed for them to chew to give them energy. They have a 2 hour break for lunch and either bring their own, or eat the food delivered daily to the land. Lunch is the main meal of the day in Bolivia, and normally consists of 3 courses - soup, meat or chicken with potatoes and rice or pasta and desert. 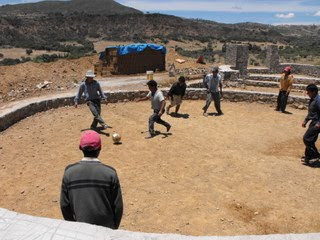 After eating our workers relax by playing football - they are very competitive and manage to ruin a ball every month! They have another half hour break in the afternoon when we distribute soft drinks or ice lollies, depending on the temperature. The working day ends at 6 pm. 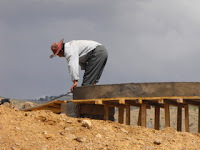 It may seem that workers in Bolivia have a lot of time off during the day, but it must be remembered that everything has to be done by hand - mixing concrete, hauling heavy adobe bricks, stones, etc. 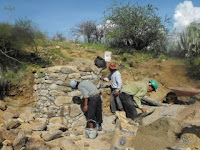 Our men work hard, and we appreciate their help with our project. 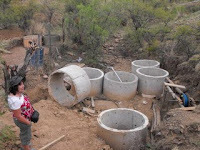 In Bolivia it is the law to build a wall or fence around every rural property at least 2 metres high, principally to stop animals entering and causing damage, but also to provide security. 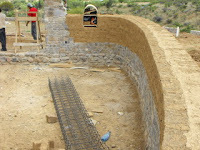 To embark on the massive undertaking of fencing and/or walling over 10 acres straight off would have delayed our adobe brick-making process and the subsequent build of the Roundhouse. So we decided to focus on securing an area around the house and thereby creating a garden. A sad, but very real fact of life in the poorest country in South America is that everything is a potential target for theft in Bolivia. We knew we would have to employ a caretaker once the house was built so that we could leave it safely to go into Sucre or further afield. 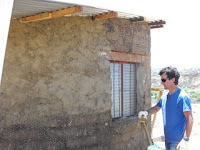 On our trip to Chile we had seen a guardhouse incorporated into a wall, and we decided that we would replicate the design. 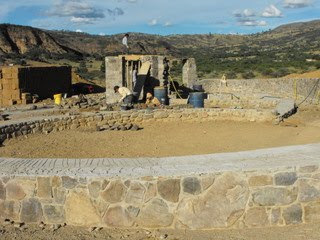 We were also inspired by some small dome shaped buildings made of adobe in the garden of Cafe Mirador, overlooking Sucre. 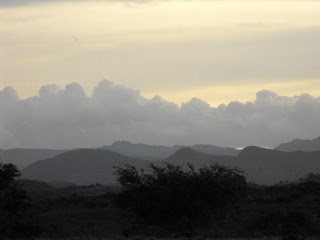 Later on, when the whole property will be fenced in, we could build a new guardhouse near the to the hacienda on the road, and we could use the original guardhouse as a meditation or quiet space. Ed also came up with the idea of building an adobe archway linking the garden to the area we had designated for the swimming pool. 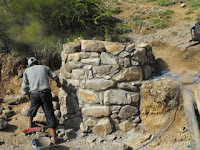 We used river rock to fill in the thick walls at the base of the arch, and some of them were quite beautiful. 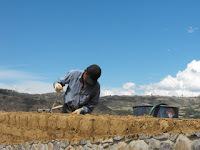 As with the walls to the Roundhouse, we dug a trench for the garden wall, filled it with river rock and then poured concrete to form the foundations. 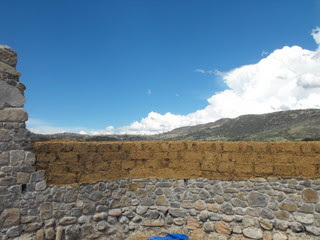 We then built stem walls using the stones on the land to support the adobe - where we had incorporated part of the perimeter wall we would use rammed earth formed between wood forms, but the garden walls being much thinner, would take a single row of adobe bricks. 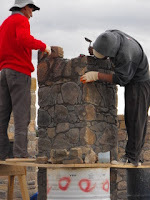 We were so impressed with the quality of Jeronimo's stonework - assisted by Freddy - that we decided to build the columns to support the doors and windows out of stone. 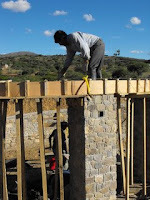 The columns are built onto the foundation walls with each stone being selected to provide a clean line for the window and door frames to abutt. However, Ed has decided to have some of the column edges rough to give the impression of the walls having been part of a ruin. 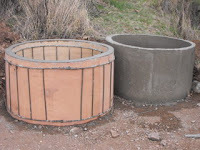 The adobe bricks can then be incorporated using mud between the jagged edges and the adobe bricks. Hipolito, our foreman, is not a bad stonemason either - this is his work, the first column in my bedroom. Another fine example of the quality of work produced by our team.